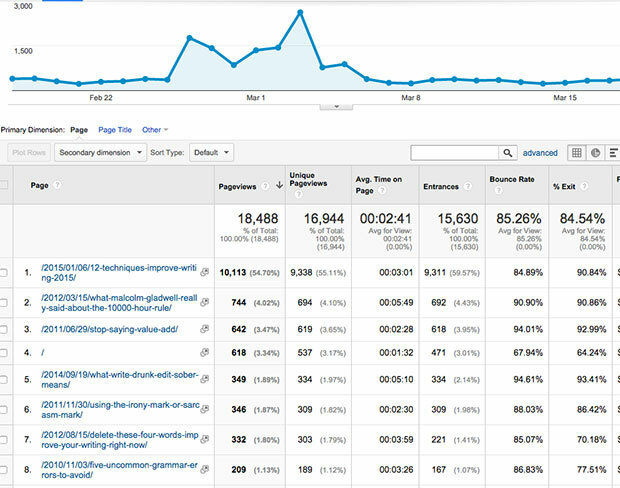 Are you tracking the right metrics so you know how to improve conversion rates for you site? Whether it’s click-throughs, newsletter subscriptions, or just plain old sales, your conversions are the lifeblood of your content marketing. It represents the number of people who moved from one stage of your funnel to the next. The ones who went from curious to subscriber to customer. Admittedly, as a word guy, when I first started doing social media marketing, my bigger concern was whether the little line went up or down, and that was it. But after paying attention to metrics, and recalling the things I learned in my college stats class, I got more comfortable with my analytics, and I paid closer attention to what was happening. Whether it’s your blog, contact page, or any other landing page, you want to know how many people came to your site. This is the biggest indicator of web traffic, and the number of people who are checking you out. While a 50% order rate might be great, if you’re only getting six visitors a month, you’re going to be out of business before I finish this sentence. How to Improve It: This is the biggie. Everything that follows will tell you how to do this: bigger social networks, bigger email subscription list, faster load times, and search engine optimization. If you can juggle all these plates, this number will grow. Let a couple plates fall, and your traffic will do the same thing. This helps you see what kinds of devices people used to visit your site, whether laptop, tablet, or mobile phone. You can even see which device your visitors are using. If nothing else, this will illustrate the importance of having mobile-friendly websites. And if you’ve been receiving emails lately from Google Webmaster Tools telling you your site isn’t mobile friendly, you’ll understand why. How to Improve It: Your mobile visitors are only going to increase, so don’t wait to fix this one. If you’re getting a new website, make sure it uses HTML5 and responsive design. If you have a website, make sure you have a mobile friendly theme. If you have a WordPress site or blog, use the WPtouch mobile plugin. Your goal is to increase conversions — that includes the mobile environment. This is how long each of your pages takes to load — the faster, the better. That’s because Google includes page load times and speed in their SEO rankings. Google Analytics will tell you what the average load time is for your site, and then tell you how each page performs against that average. How did people get to your website? Social? Organic search? Direct clicks? Knowing this tells you where you should put more of your energy or what you should shut off. If organic search is pulling in over half your traffic, that’s good. But if your email newsletter is only bringing in 2%, you need to put more energy into improving your lists and the quality of content you send out. How to Improve It: Small lists don’t bring in big traffic, so grow your list, and test everything to see which gets more traffic. (Your email service provider should have A/B testing available, so use it). While you’re at it, grow your social networks and become a rock star on one or two of them, rather than trying to juggle six or seven. Create drip campaigns on all channels to drive more people to the website. Consider creating geo-targeted or demographic-targeted social and web ads as well. Begin to implement these ideas to increase your conversion quickly. There are two types of viewers, new and returning. Either they’ve been there before, or they haven’t. This is measured by looking at each visitor’s IP address. If an address is new, the visitor is new. Otherwise, they’re a returning visitor. Returning visitors mean stronger interest. If you’re doing lead nurturing via a system like Hubspot or OutMarket, you want returning visitors, because it contributes to their lead score. Returning visitors become paying customers; one-time visitors usually do not. How to Improve It: Develop a strong content marketing and lead nurturing program that puts you in regular contact with your list. Send newsletters with links back to your website. Send invitations for white paper downloads and other activities on your site. Give people a reason to return, such as a new blog post once or twice a week. This refers to how long people spend on your site per visit, as well as per page. A well-written blog post can keep people there for a few minutes, but a poorly-written one, or a page that doesn’t contain very much helpful information can see them leaving in a few seconds. This is one of the signals Google uses to measure how good a site is. Since the search engine can’t understand how well (or poorly) something has been written, they look to TOS as an indicator of whether we think it’s good. The more time people spend, the better it is. How to Improve It: You can improve this time just by writing good stuff. Do A/B testing on your different types of content, and reproduce the stuff people spend the most time reading. Also, consider adding short videos to a page. Even if a visitor only watches 30 – 60 seconds of a two minute video, that improves your TOS. Keep testing and measuring your results so you know how to improve. Unlike websites 15 years ago, we no longer go to a home page and then click around to navigate. Thanks to social media and email newsletters, we can land on any page in a single click. This stat tells you what pages people landed on the most. They usually come from social sharing, email marketing, referrals, and search engines, which means they’re usually blog posts (but not always). How to Improve It: When you’re striving to increase conversions, you will come to find out that a single page can capture the interest of thousands of people at once. In my case, it was a blog post about techniques for improving your writing, and I got a big boost from StumbleUpon.com. That means I should not only write similar articles, but I need to keep submitting them to StumbleUpon too. This is the third time they’ve been a huge source of blog traffic, so I just need to keep pursuing them and creating the kinds of content they’d like to share. These are the pages where people leave your website, and most of them will leave on the same page they landed on in the first place. If you find that most people all exit on the same page, such as hitting your front page and leaving again, you need a makeover. If you have a 2- or 3-page subscription or ordering process, and people leave on the first or second page of that process, it may be too complicated, and needs a makeover as well. Keep it simple and people will be more likely to complete it. How to Improve It: Rewrite the copy, change out the graphics, and make the thing easier to read and navigate. Reduce the number of steps necessary to make a purchase or subscribe to your newsletter. Utilizing a email capturing tool like OptinMonster may also be in order, to help you collect lead information before they leave your page. There are dozens, if not hundreds, of metrics you can track for your website as you strive to improve your conversion rate. These eight metrics can guide to always be improving your site, which will lead to more opportunities for sales. If the little lines on these metrics are going up, your revenue should be going up too. Did you like this article? Check out our guide to get a better ROI from your content marketing. organic SEO is on its way out, could they be right about search engine optimisation? Hi Allan, SEO is still essential. We’ll be talking about this in more detail in an upcoming keyword research guide. In the meantime, check out our on-page SEO checklist. And follow us on Twitter and Facebook to keep up with our content as it’s published.